I’m all about good, clean beauty and Virginic is just that. Before I even tried the advanced eye serum and night repair serum, I was impressed by their 16 badges of purity. Needless to say, they take pure skincare seriously. All of the products are vegan, non GMO, paraben free, no synthetic fragrance and no artificial colors just to name a few! One of my favorite things about the product is the roller ball application, which makes it supper easy to apply and prevents product waste. One of the most noticeable benefits I have seen is less puffiness around my eye area. One of their pro tips is to store it in the fridge so the roller ball gets cold and then use it as needed. This quick pro tip is a must for tired eyes! Think of this product as your daily skin renewal. Besides loving the amazing scent of the product, I loved how my skin felt the morning after! To get the most out of the Night Repair Face Serum, cleanse your face throughly then pat dry. Add 2-3 drops of the serum to the palm of your hands and rub together. Apply the serum to damp skin and let it soak in 5 minutes before applying moisturizer. You will wake up to an incredible morning glow! Both products share similar natural ingredients that are known to do amazing things for the skin. Almond Oil helps the skin retain moisture and can heal dry skin. Avocado Oil helps to reduce inflammation . Vitamin E helps to reduce the appearance of dark spots while Vitamin A encourages healthy skin cell production and protects against UV damage. 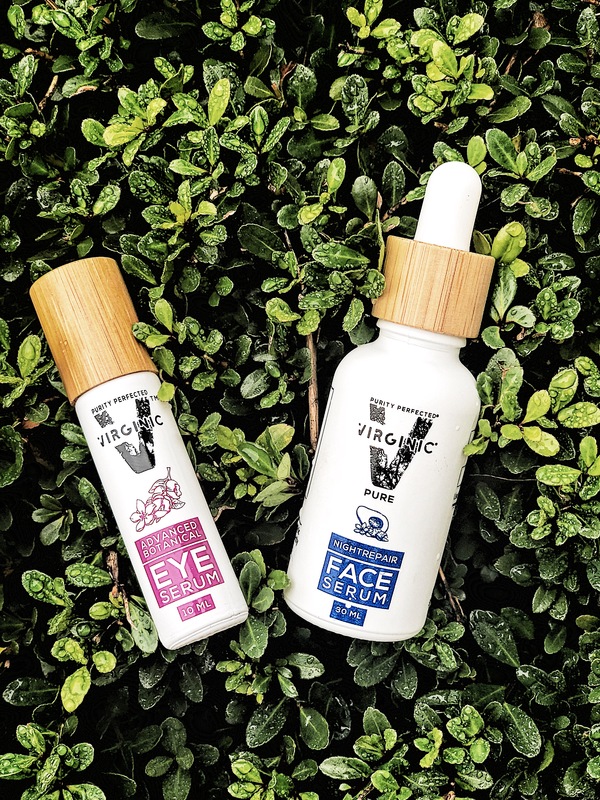 Check out the full range of Virginic products and use code ALEA10 to get 10% off your entire order! I’m sharing the love and giving TWO followers a set of the advanced eye serum and night repair serum! Entry details are below! Good luck!